Three years ago at the 2014 Breeders' Cup World Championships, a gelding named Cary Street flew three wide around the final turn of a 1 3/4-mile event, came storming into the Santa Anita Park stretch, and pulled away from his competition to register a 9 1/4-length victory in the $200,000 Las Vegas Marathon Stakes (G2). "I claimed him for $10,000 (in February of 2013) and I didn't think for a second that he was going to reach the heights that he reached," trainer Brendan Walsh said. "He won me my first graded stakes (the grade 3 Greenwood Cup Stakes) and then we brought him to the Breeders' Cup and he won," the trainer added. "I will never ever have another horse who will do for me as much as he did. He put us in the spotlight for the first time. "You always knew when he went out there that he was going to give it everything. He never let us down that way, not once. He'll always have a place in my heart." But after the Marathon, the runner's form began to fade and minor injuries popped up, making Walsh think that it was time for Cary Street's retirement. Around the time 'Cary' was looking for a new off-track life, veterinarian Dr. Stephanie Butler, who was working with Dr. Daryl Easley at the time, was around Walsh's barn at Keeneland and was looking for a new mount. "My friend told me about (Cary Street) and he had a suspensory injury. It wasn't bad but it was enough that they opted to retire him," Butler said. "When I talked with (Walsh) and the groom, everybody was like, 'I love that horse, he has the best personality.' It was kind of repetitive that everybody really, really liked him... so, I was just like, 'Wow, this must be a really cool horse!' "
In July of 2016, Cary Street moved to his new home, Ramblen Farm near Versailles, with his new owner, Butler. 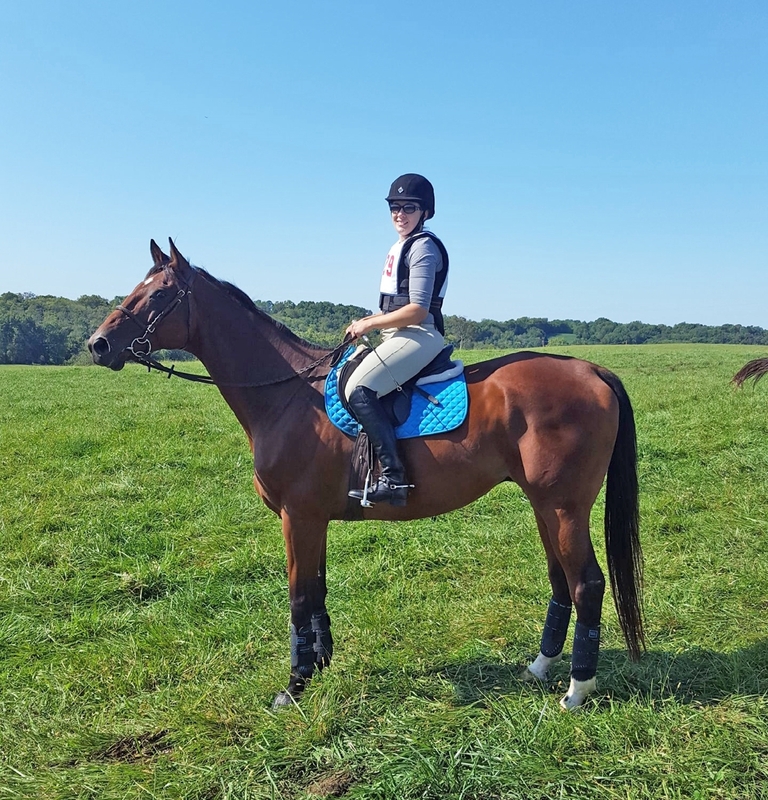 She gave him some down time before embarking on a retraining journey toward a second career, with the long-term goal of competing in lower-level eventing. 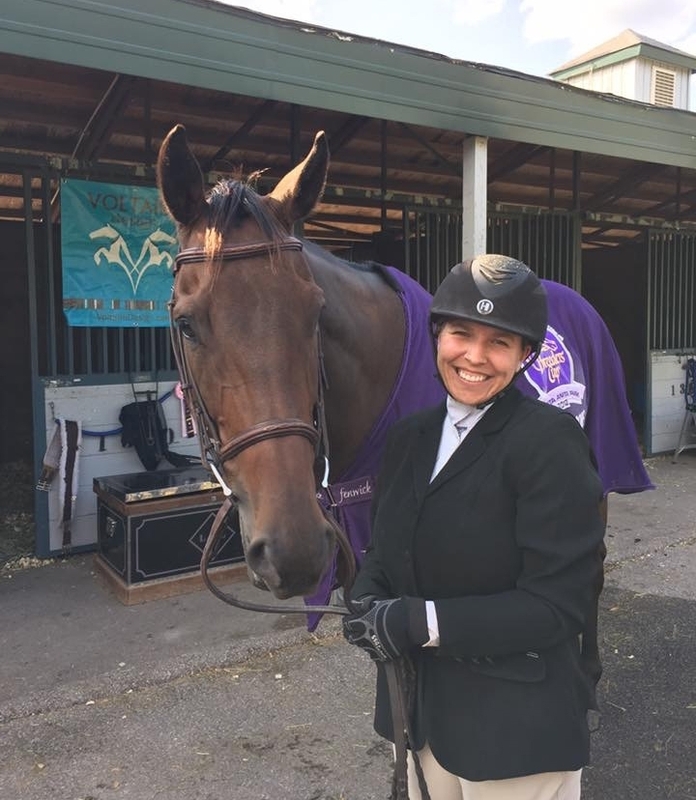 The pair recently competed at the 2017 Thoroughbred Makeover presented by Thoroughbred Charities of America, where they finished fourth in competitive trail and 11th in the field hunters. But overall, Butler just enjoys spending time with her personable mount. "He has the biggest personality. You know exactly what's going through his brain," she said. "He's very expressive. He loves being the center of attention." Another former Breeders' Cup competitor with a heart of gold finding his stride in a second career is 2012 Breeders' Cup Juvenile Turf (G1T) runner I'm Boundtoscore. The gelded son of Even the Score failed to place in the Breeders' Cup, but retired from racing with $251,442 in earnings and two stakes wins, including the Summer Stakes Presented by TVG (G2T) at Woodbine. Around two years ago, the Indiana-bred's former co-owner Troy Rankin was introduced to Laura Janke. After I'm Boundtoscore had been retired and had some down time, Janke remembers going to see the gelding with a friend who was shopping for a horse. "(Rankin) pulled him out of the field and she (her friend) really wasn't interested. Me and my sister were looking at him and I was thinking to myself, 'I hope she doesn't want him, because I want him,'" Janke recalled. "He was just beautiful and he just had this spark about him. "We told Troy we would take him, and I started researching him online and there's all these articles on him. I was like, 'Wow, I've never had a Thoroughbred off the track that's actually done anything before.' "
Janke brought the horse home to her Holladay Hills Stable near Lexington and, like she does with other off-track Thoroughbreds, let him choose his own second career. 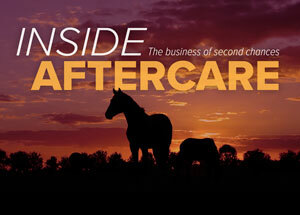 "At our barn we do a lot of off-the-track Thoroughbreds, it's what my sister and I specialize in—getting them off the track and retraining them and put them in whatever discipline they seem to enjoy... We usually rehome them, but this one we're keeping. He's too special." "We decided that because of his attitude—he's very fiery, he loves to jump, he can be a little quick, he turns really fast—he just wasn't a hunter at all. He could probably be an event horse, too, but we just really like doing the jumpers with him." They've found success in the 2'6" jumper classes, picking up blue ribbons at local shows, and Janke hopes to continue his progress through the jumper divisions. There's no other breed she'd rather be riding at shows. "Thoroughbreds are so useful, I think they are the best horses you can use for competition," she said. "We've always had Thoroughbreds, and we've had Warmbloods too, but I love my Thoroughbreds."